Emily and her husband Sandy Portman seemed to live a gracious if busy life in an old-world, Upper West Side apartment in the famous Dakota building. But one night on the way to meet Emily, Sandy dies in a tragic accident. The funeral isn't even over before Emily learns she is on the verge of being evicted from their apartment. But worse than the possibility of losing her home, Emily is stunned when she discovers that her marriage was made up of lies. Suddenly Emily is forced on a journey to find out who her husband really was . . . all the while feeling that somehow he isn't really gone. 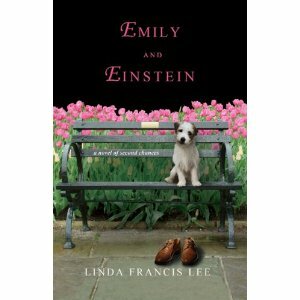 Angry, hurt, and sometimes betrayed by loving memories of the man she lost, Emily finds comfort in a scruffy dog named Einstein. But is Einstein's seemingly odd determination that she save herself enough to make Emily confront her own past? Can he help her find a future—even after she meets a new man? LINDA FRANCIS LEE is a native Texan now living on the Upper West Side of Manhattan. The author of twenty books that are published in sixteen countries, when Linda isn't writing she loves to run in Central Park and spend time with her husband, family, and friends. AWWWW -- there is a puppy on the cover....I'm sold! A scruffy dog that leads to love. Boy, somebody has my number. I've been waiting for this too! I've read a couple of Lee's other books and really enjoyed them. That sounds great, I haven't heard of this author before. I've got this one on my list, too...great pick! I remember hearing great things about her last novel, but I never got around to reading it. I'll have to keep my eyes peeled for this one! Oh yea, you had me at first sight of the cover! Oh I love the cover of this one, but it sounds like it might be to sad for me. I won a copy of this on Goodreads and I'm just wait for it. I can't wait to read it. Definitely a must read! Thanks for sharing. You're so right --- the cover is adorable!